Matt & I went to the state fair yesterday. FUN TIMES! I love the people watching, the random crap (is it okay to say crap? ), the giant squash, the horse shows, and the FOOD! 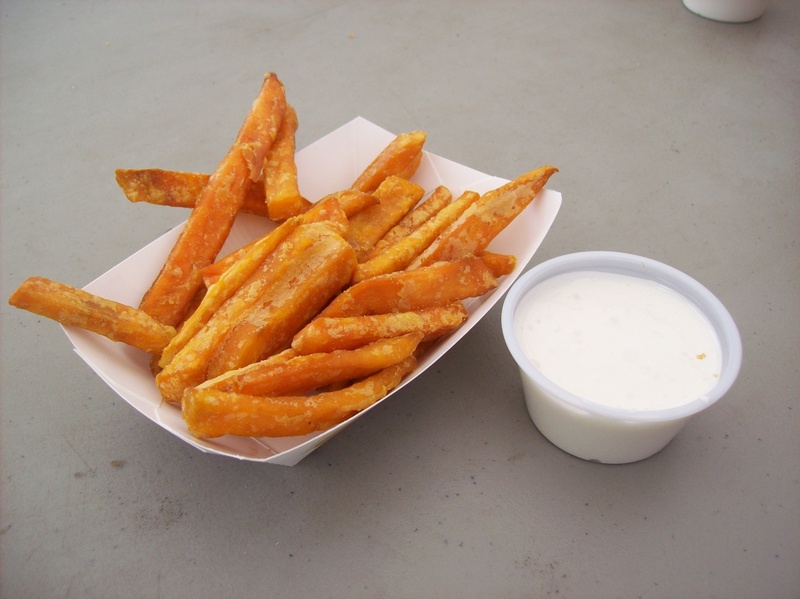 I took a photo journal of all the food we got at the fair yesterday…. some of it was shared, and some of it was not. Don’t judge me, I’m on a diet for the rest of the week after looking at all the pics again. Ha! 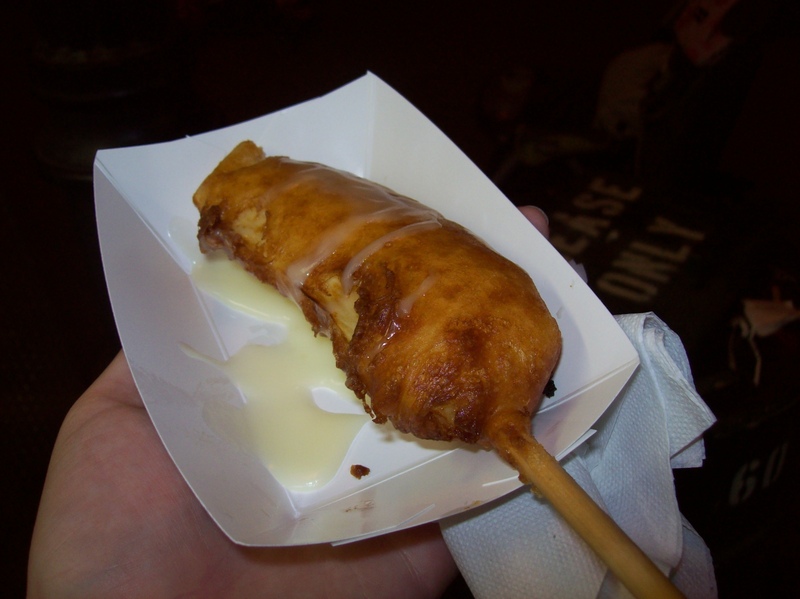 not really, but seriously…..
Now, a corn dog is my hands down favorite fair food… will always be. So when I saw this year’s corn brats, I was stoked. Sadly, they were made from Johnsonvilles. 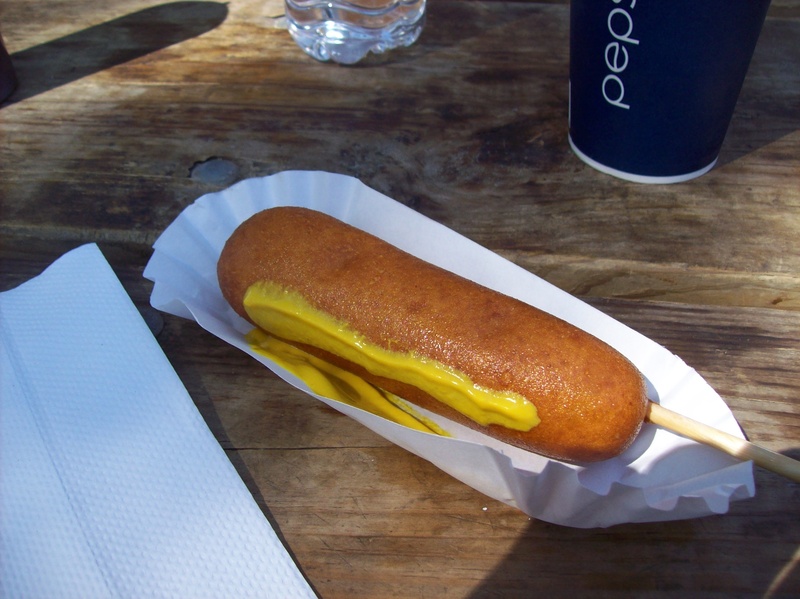 So, it was more like a fancy corn dog than a brat. So, when rated amongst corn dogs, this one was pretty good. I got myself a funnel cake while Matt was viewing the train exhibit. I didn’t figure it was necessary for me to pay two dollars to see it when I don’t enjoy it as much as he does…. so I let him go alone, and I went in search of funnel cake! This was was Amazing. I sat myself down on a bench, chatted it up with an elderly couple, and munched away while waiting for Matt. He was done, and the funnel cake was half gone…. He laughed when he saw me (did I mention my husband thinks it’s ridiculous to pay $5 for a funnel cake, since it’s just fried batter?) I offered him some of the deliciousness. He turned me down about three times, until finally I made him sample some. 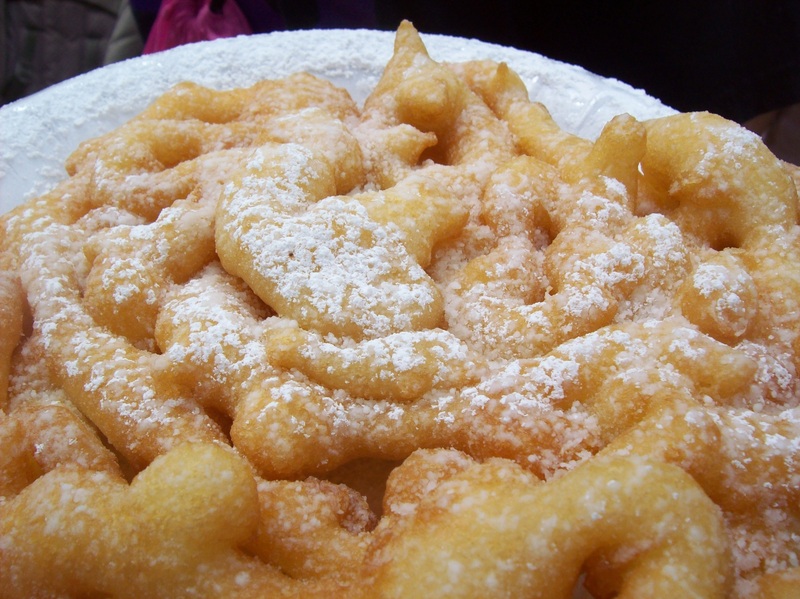 And, then….. he agreed about the tastiness of this funnel cake! He claims to have had an unfortunately bad funnel cake experience, which is why he doesn’t like them. I think his mind has been changed, though. This was Matt’s supper. He HAS to get one every year! 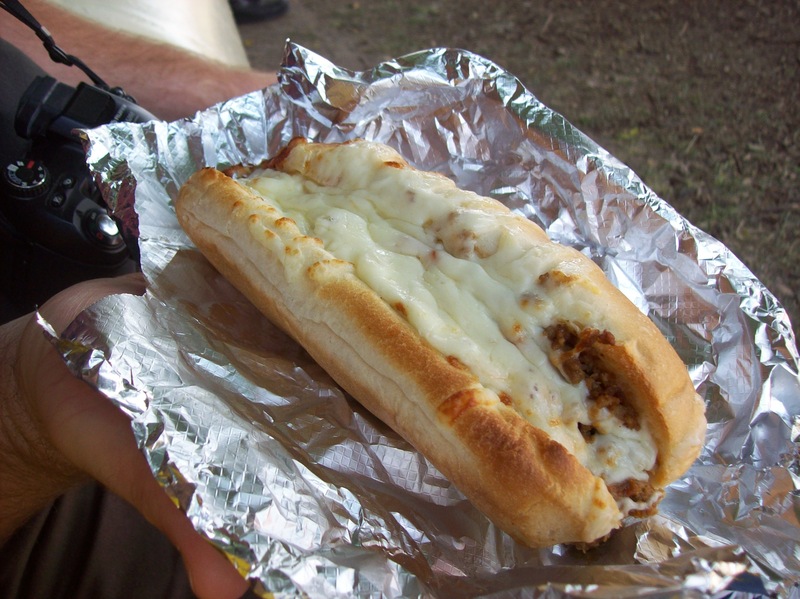 $7 worth of Italian sausage, sauce and cheese on a hoagie. 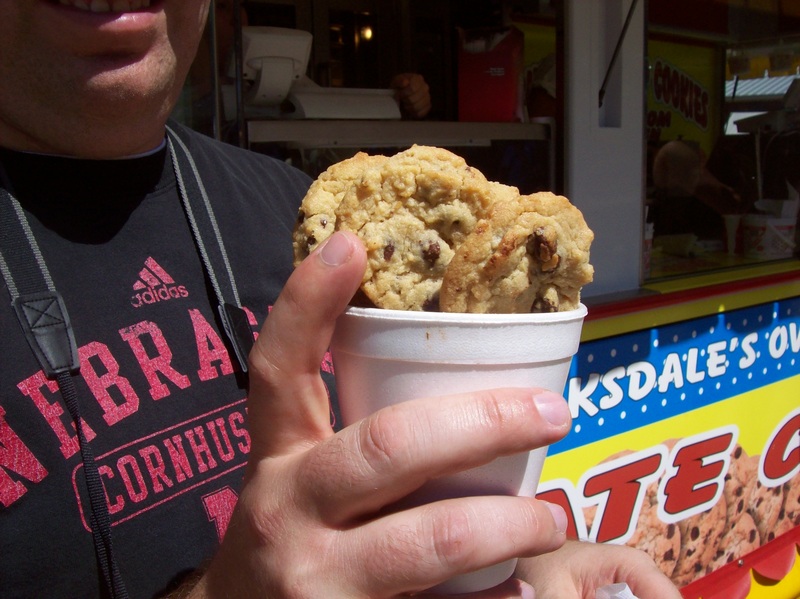 I should take lessons from the state fair and make him something similar. I mean, I can imitate Runza, why not a Gismo? This was by far the best decision I made while at the fair! 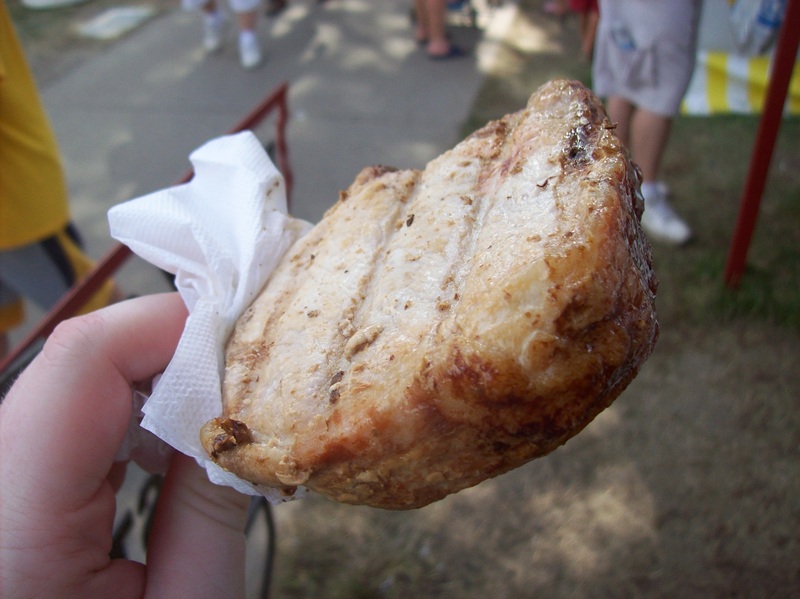 My dinner: a tasty Iowa chop. I took a picture before saucing it up…. since all they had was Cookies. (where’s Corinn to make the fake barf noise when you need it?) The only thing Cookies has going for it is that it is after all still BBQ sauce. Give me some good ole Countryside or Sweet Baby Ray’s and I would have been a happy woman! We both got our own pineapple going on last night. If you can tell, they dipped a hunk of pineapple in funnel cake batter, and fried it. Then, coated it with some sort of icing. Just say no to the icing! It wasn’t necessary. 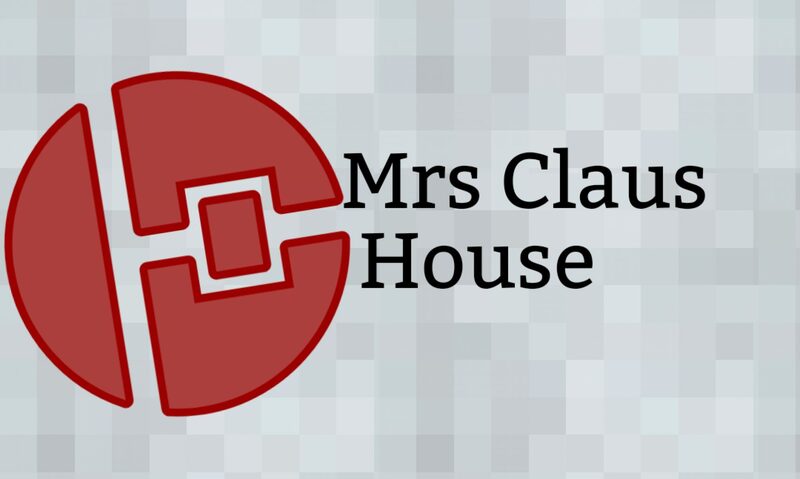 I expected my world to be rocked by this, but it was not. Don’t get me wrong: it was good. But, it was my messiest moment. My pineapple still had a little of the hard center on it…. so it was a little hard to eat around, which caused fingers and face to get a little sticky. they were right between the pork producers & the pork chop on a stick. the sign said johnsonville on it if i recall. Previous PostPrevious Look What My Man Did!